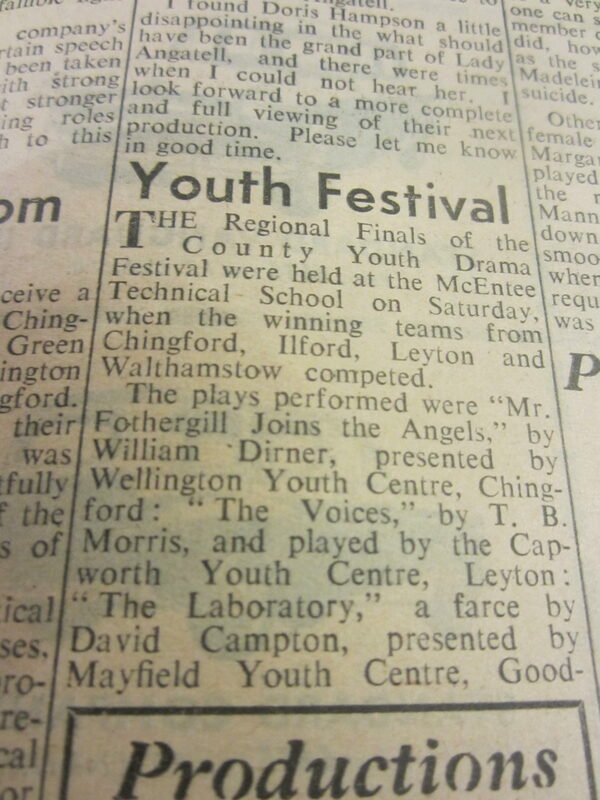 What is now known, thanks to the reports in the Walthamstow Guardian archives, is that the Drama Club entered 3 plays into the 1958 Essex Youth Drama Festival. The first of these was ‘Poison, Passion & Petrifaction’ by George Bernard Shaw and this was, it is thought, the first actual play performed by MDC – although there may well, of course, have been others during the earlier years when it was ‘merely’ an ‘After School’ group? 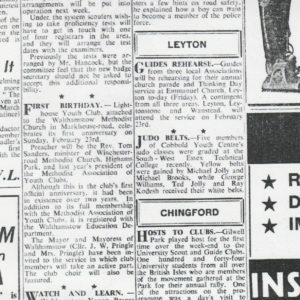 As is shown in the first two newspaper reports, the other plays were ‘The Man in the Bowler Hat’ by A.A.Milne (re-staged by the DC in 1974) and ‘The Family Group’ by Mabel Constandurous – the script of which has recently been found – and initially thought to have been presented towards the end of the life of the Drama Club – so a rough estimate that was only around 18 years adrift!!! 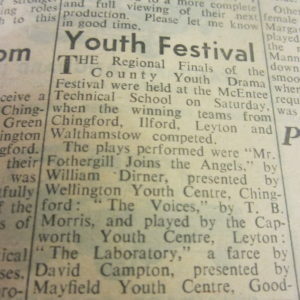 The third newspaper report confirms that there were four teams in the final and that this was won by the Mayfield Youth Centre in Ilford with a play called ‘The Laboratory’ – a farce by David Campton. 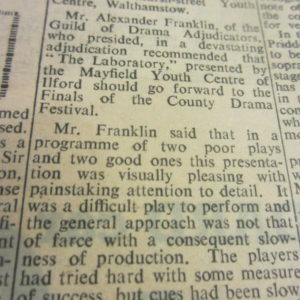 Unfortunately the rather ‘devastating adjudication’ (as described by Peter Denholm – the Guardian Reporter) does not indicate what place ‘Poison, Passion & Petrafaction’ came – nor whether it was one of the two plays considered as ‘good’ – or one of the two plays considered as ‘poor’. Alas – we will never know – but going by the consistency of results of this competition in later years – and understandable bias – MDC probably came second! Interestingly, in edition of the Guardian a week or so later, Peter Denholm wrote an article along the lines of the importance of encouraging young people – not destroying their interests and self worth by inappropriate and unhelpful negative adjudications. In this respect he referred to the example of an extremely upset young girl who thought, on the basis of what had been said at the adjudication of the above ‘Final’, that she had let all her friends down – and was consequently inconsolable! Just shows how lucky the MDC was to be run by adults who knew how the work with, encourage and get the best out of, young people – and make it great fun! This short play by George Bernard Shaw, which bears an interesting subtitle of ‘The Fatal Gazogene: a Brief Tragedy for Barns and Booths’, was first performed in a ‘Booth’ in Regents Park in 1905, and was described as a ‘comic mock melodrama’ – so ‘very Markhouse’ – and indeed there is some recall of the intention to repeat this 1958 performance at a later date. Unfortunately this did not happen, which was a great pity for those in later membership – as at least one member can recall Cyril Malyon’s recount of an hilarious scene where one character (Adolphus) foams at the mouth after being poisoned – and then swallows ceiling plaster as an antidote – a stage effect apparently facilitated via the use of a goodly helping of meringue! According to Mick Everett the play was filmed by the BBC, so possibly, somewhere in either their own, or Walthamstow Council’s archives, there may still be a copy – so we live in hope that the above scene might eventually be seen! Meanwhile, in addition to the inclusion of the newspaper reports, it is also possible to show the list of characters – which hopefully might prod a few memories of who actually fulfilled the roles! 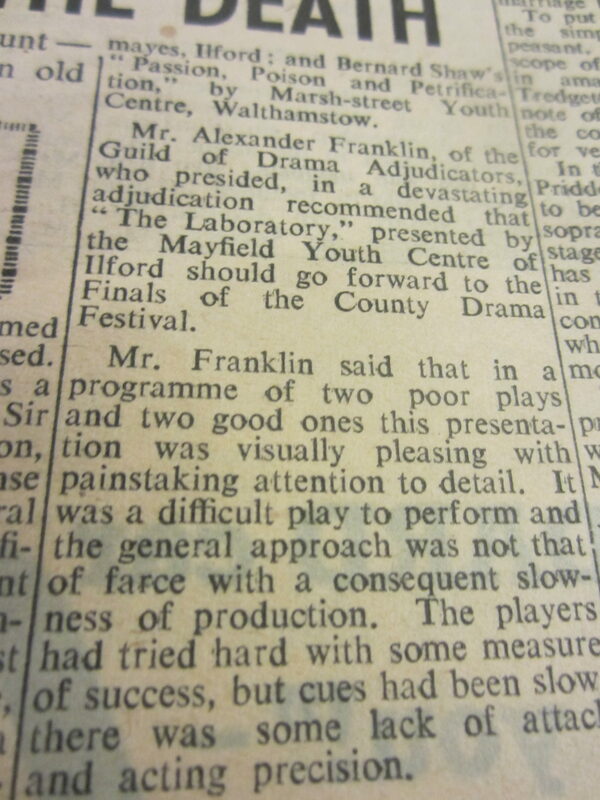 Guardian Report – ‘Waiting For A Cue’ – Essex Drama Festival – ‘Passion, Poison & Petrifaction’ – 14 February 1958. See typed text below. ‘Young drama enthusiasts at Marsh Street Youth Centre are spending most of their spare time learning their lines. Eachh Monday they meet at Markhouse School, Walthamstow, rehearsing their parts in the Essex Youth Drama Festival. Marsh Street hopes to enter three One Act Plays for the festival. They are ‘Passion, Poison & Petrifaction’ by George Bernard Shaw, ‘The Man in a Bowler Hat’ by A.A. Milne and ‘The Family Group’ by M Constanduros’. There will soon be vacancies for new members in the group. The clip also adds the following lines – which may just be a misprint? ‘In an effort to form a larger metalwork class, the meeting time is to be changed from Friday to Wednesday’ ???? NB: Read the synopsis of the play on Wikipedia – it sounds a real hoot and, additionally, confirms that a ‘Gazogene’ is a Soda Siphon! 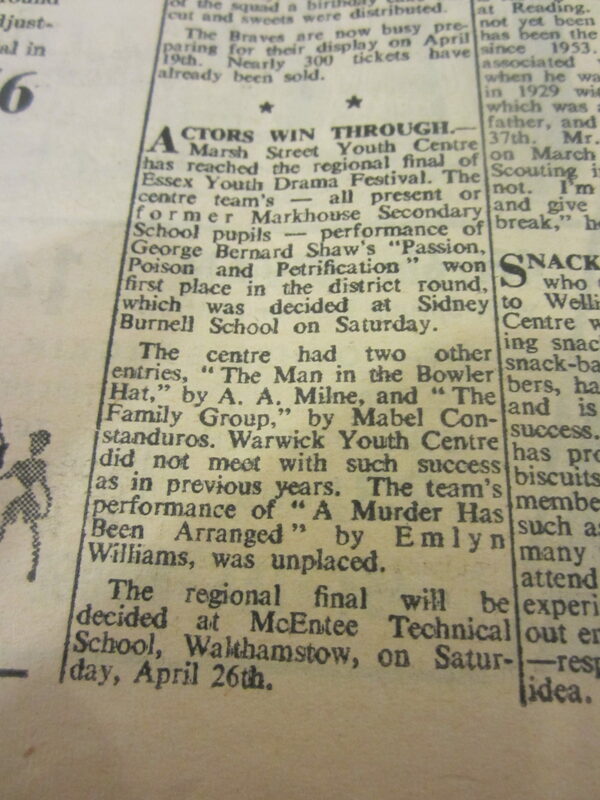 A.A. Milne’s One Act play, ‘The Man in the Bowler Hat’ was one of the three Drama Club entries in the 1958 Essex Youth Drama Festival. According to the Samuel French copy of the script, the plot of the play suggests that ‘A terribly exciting little affair happens in the humdrum life of John and Mary, a tempest in a teapot, but while it lasts–well, it’s high comedy, at least for the audience! The action takes place in Mary’s sitting room – the most ordinary sitting room in the world. The play was re-staged by the Drama Club in September 1974 as part of an evening of 4 One act Plays. 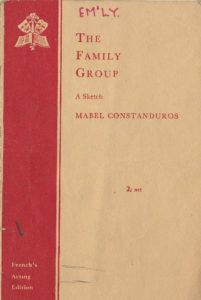 Mabel Constanduros’ One Act play, ‘The Family Group’, was one of the Drama Club’s three entries in the 1958 Drama Festival – along with ‘The Man in the Bowler Hat’ by A.A. Milne and ‘Passion, Poison & Petrifaction’ by George Bernard Shaw – with the latter winning the District competition and progressing onto the County Final. The cast of the MDC entry is not known, nor where it was placed in the results of the District competition – BUT! 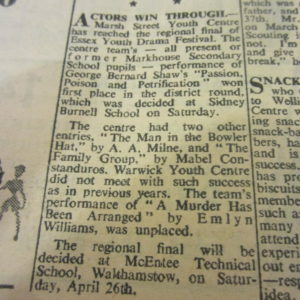 A recent Face Book posting linked to the school by ‘Doreen Sayers’ states that she was in this play – but not which part. Doreen would therefore have been one of the original MDC members – who may, it is hoped, be able to provide some more information in due course!